Mary and Arthur’s baby was born (below). Congratulations! For the first time since surgery, Anh and I did our regular morning run. One lap shorter than normal (only 3 miles), and Anh pushed the jogging stroller, but we did it! This was only 4 weeks, 6 days postop from FFS – more than a week (by a day, ok) ahead of when I was told I’d be able to do it. We got ready, I drove to work, and got my cool new badge (new name, new picture). 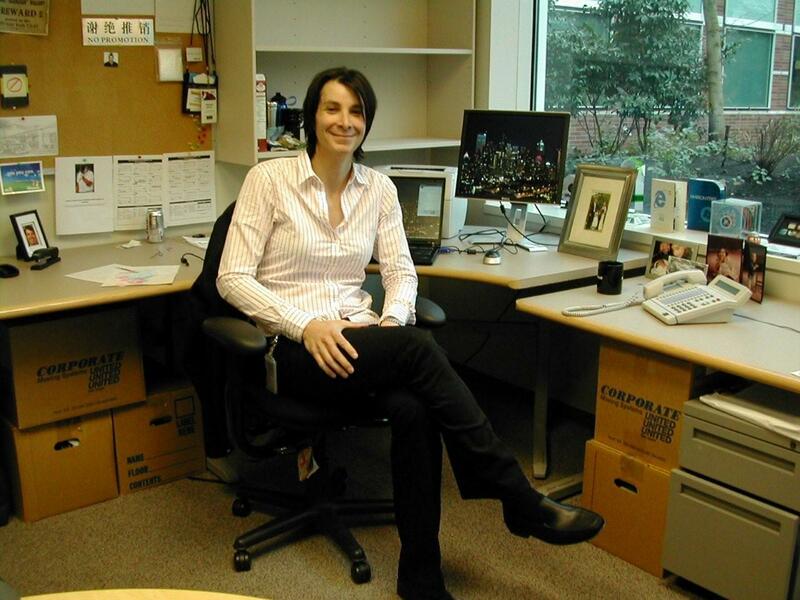 Here’s me at my desk at Microsoft here in Redmond, new badge and all! Yay Megan, you look good. Megan >> Thank You Nga! Megan >> Well, laughing still hurts. You got me… and a blush too! Megan>> Why thank you… note that Anh was able to run further and faster than me while 5 months pregnant (I could only win at 6 months), so I feel no great accomplishment! But, thank you! >> Ah, good eye. Maybe I’ll post a picture of my board, and explain all the random stuff there. But, my favorite things on the board are the “No Promotion” sign (which is in English and Chinese), the “Big Blue E Dropoff At Netscape Picture”, a postcard from Wickford Harbor (the little town in RI I grew up in) and my handmade “(arrow down) Adjectives (arrow up) Nouns (arrow up) Verbs”. I’ll explain this one in the comment. I travel a bunch to China. If you go there much, you’ll notice that there’s a bunch of “Chinglish” thats used. Misspellings, grammar issue, misuse of terms, you name it. Me and one of my coworkers were in Shanghai at one of the many outdoor markets, and they were selling all sorts of signs to be used by local vendors to post. We looked at the store, and laughed at a whole bunch of just funny signs. Later that night, my coworker presented me with a gift of that sign (he worked for me then, and it was close to review time, when most promotions are done). I thought it was hilarious. What I think it actually means (when translated properly) is “No Soliciting”. However, its been translated “accurately” but not “correctly”. So, even though I’ve moved offices twice, I move this sign and put it up. However, sometimes this has unintended effects. Clearly, if you hear the whole story, its funny, and is about a memory of a great trip to China. It has nothing to do with me not wanting to promote anyone. More than one person has come to my office, and basically said “I’m afraid to ask, but whats that sign mean?” Usually they have a scared look when they see this for the first time. When I explain, they smile, and its a good chat! Megan, please check out hairzapper.com. Electrolysis on the MTF is a risky business. Please avoid laser and thermolysis. It will spoil your looks forever. You have the resources, fly down here to San Jose and have the best electrologist in the world take care of your skin. I did.